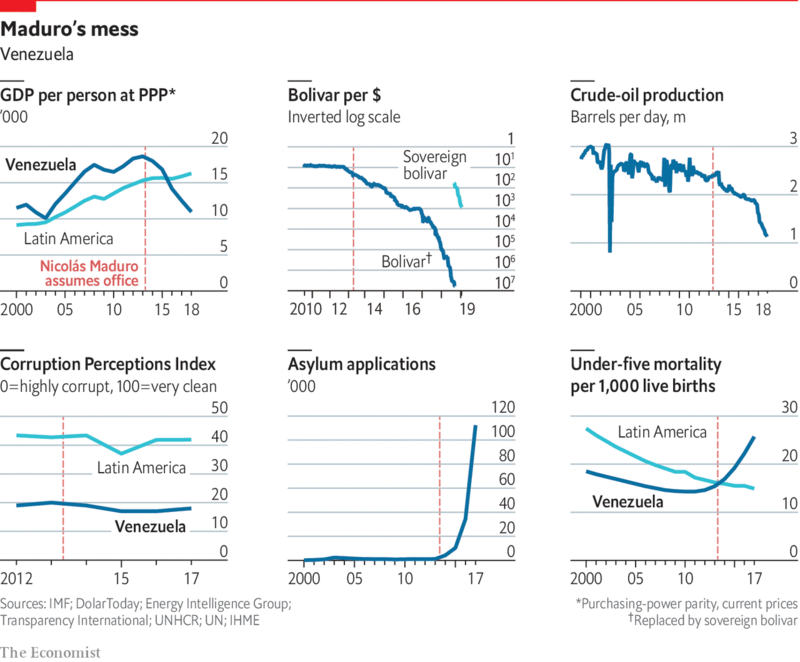 Under Mr Maduro, Venezuela’s descent into economic chaos and human misery has been staggering. Since 2013 GDP has nearly halved and inflation has rocketed to more than 1m percent. The sovereign bolívar, launched in August 2018, has already lost over 95% of its value against the dollar. Food and medicine have become scarce. Three-quarters of Venezuelans have lost an average of 8.7kg per person. Infant mortality has jumped by almost 10 percentage points. The misery has prompted 3m Venezuelans, a tenth of the country’s population, to flee, mostly to neighbouring states such as Colombia.